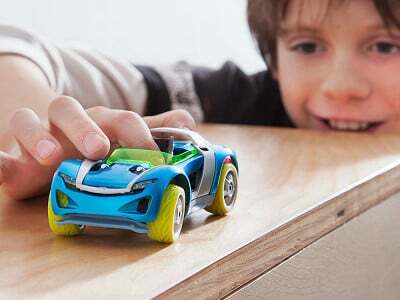 Modarri cars are the ultimate toy car, built by three auto enthusiast dads with more than 60 years in the toy industry. They modeled Modarri after Italian supercars, with sleek design, working suspension, and responsive steering. Kids power, steer, and stop using a single finger, experiencing the real mechanics first hand. 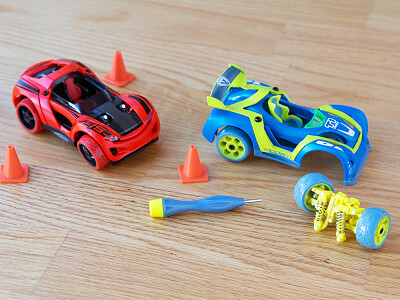 Durable and interchangeable, Modarri cars are easily taken apart and reconfigured. All of the parts can be mixed and matched between models. With the included hex tool, you can customize your ride into one of thousands of possible looks. Precision design and soft grip tires offer a tight turning radius. Make some figure eights or wheelies. Race against your friends. Then change up your car’s look. 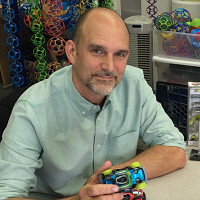 Makers David Silvergate and Brian Gulassa went all in on the debut product from their company, Thoughtfull Toys. The detail and deliberation they put into Modarri cars make them unique, stylish, and fun. These gorgeous cars are ones kids will love exploring and parents won’t mind having around. Hello All - we're excited about our launch today with the team at The Grommet. Please check out the video above and feel free to ask us any questions you may have...thanks! @Tom What age range are these cars for? They look so fun! Trevor Hite here from Modarri. We are advertising them for 8-108 (great for car guys too), but younger kids love them. A 6 year old may need help with the wheels. Tom, can the Dirt Car be played with outdoors in the dirt or is it just a 'look'? We made these cars to be durable. They can be played with in the dirt, sand, water...whatever. Picture when you were a kid making tracks on the hillside with your friends...This is perfect for Modarri. If they get clogged up with dirt...rinse them with water. So these are cars that you have to assemble? Is it suitable for a 5-7 year old? @W The published/tested Age Grade is 8-108, but as every Mom/Dad knows, their 5,6, and 7 year old is at least as smart as an 8YO. @Denise Great Question and couldn't agree more. 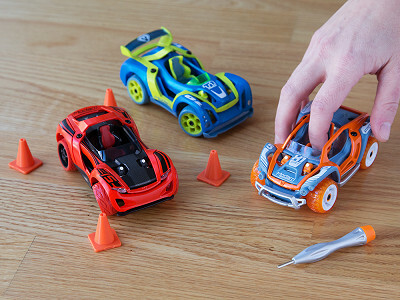 It's funny because in our play testing and Mommy Blogger reviews, we saw as many girls playing with our cars as boys...moms and dads too. Currently the DIY Car can be painted with any colors, blue, ink, green, purple...bring 'em on. We tried to make the cars color neutral, so girls would love them too...it worked. A little secret though is that we will next year have at least one set that isn't necessarily girly, but the girls may be drawn more to it. @Trevor @Denise Hi Denise- We don't currently offer the DIY car on our site, but if you are interested, feel free to reach out to [email protected] Thanks! I think my daughter would love these! Her favorite color is fuchsia...do you have any cars with colors like that? @A Hi A - best current option is to go with the DIY car and color it any way you'd like. I'm digging Fuchsia. Definitely send us a pic of your car when you finish creating it. You can decorate the cars with enamel paints, permanent markers, nail polish, etc. @Tom @A Hi A! Modarri is great for both girls and boys. While don't currently offer the DIY car on our site, feel free to reach out to [email protected] for more information. Thanks! @michael Love this question! We took tons of images, designs, etc. into account when designing these cars from scratch. Bugatti, Maserati, Ferrari, then add some Corvette, BMW, Mustang in there, and you end up with inspiration. One of the things that we saw and loved was when you could see inside the car. We really wanted kids to be able to see the inner workings, but still look like a car. Think Motorcycle. Last, the name came from a 21 year old kid who said we needed to have an Italian super car name not a toy name, because these were something he wanted to have a real sized one of...Hence Modarri! @Trevor Michael, a little more direct here to your question is that we wanted to design something that you wouldn't mind having sitting on the table when company came. We really wanted them to be beautiful. 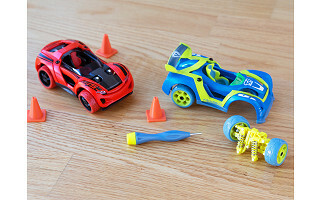 Hey Tom, my son will love taking these cars apart. Will there be replacement screws in the box incase he loses any of them? @Dorene - Hey Dorene. I love this question. ALL Modarri Cars feature "retained screws", meaning that they are engineered to stay attached to the cars with little retaining washers. Shake 'em...vigorously...and they won't come out. So, no "rattling noise" up the vacuum cleaner to worry about. One additional note...in the OFF CHANNCE that one of the screws gets separated from the part, they are standard M2 screws. You can also get them from our website for cheap. No more throw away toys! Will my teenage nephew like receiving a Modarri car for Christmas or should I stick to the younger boys? @Abbie - Hey Abbie - you hit on a topic that actually caught us really off-guard when we were first developing the Modarri Cars. They were originally going to launch with 6-12 year old children as the primary user. The more we play-tested them, it became evident that we were "off the mark" on the age range. We see kids, teenagers, adults all playing, driving, designing new Modarri car creations...it's crazy! 8-108 pretty much covers it. Thanks. If I buy a single car, can I buy single pieces that I want to change Ex: wheels or would I have to buy another car? @Alexis At this point you would have to buy a new car...starting next year there will be booster packs that you will be able to buy to trick your cars out.